jobs on 16-12-2018. Online application link active till 28-10-2018 for applying this Information Assistant jobs. Admit card for this CG Vyapam Information Assistant Exam will be available from 10-12-2018. Written exam for this Information Asst jobs will be held in 5 cities i.e. Raipur, Ambikapur, Jagdalpur, Bilaspur and Durg. Exam Pattern and Syllabus, Age limits, qualifications, online applications for this CG Vyapam IA jobs is mentioned below. 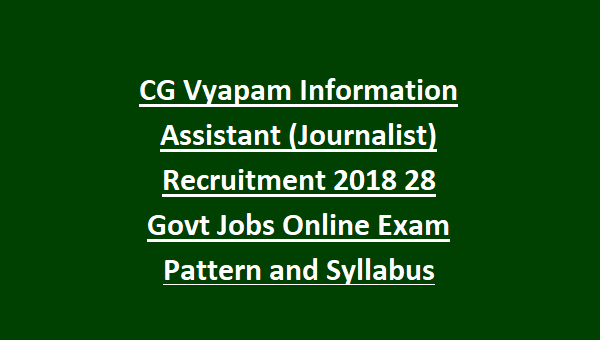 There are total 28 posts in this CG Vyapam IA recruitment 2018. As on 01-07-2018 candidates age limits are 21-35 years for all the posts. Degree qualification and Diploma in Journalism or 3 years experience in Journalism work. Level 3 pay scale is applicable for this IA jobs. Written examination will be conducted for the selection of Information Assistants. Written exam will be conducted for 150 marks. Total 150 questions will be given and exam duration is 3 hours. Written exam consists of 6 parts. 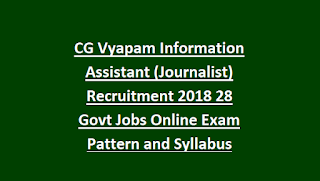 Candidates who are interested in Journalism they can apply online for this Information Assistant jobs through official website of www.cgvyapam.choice.gov.in website. Last date to apply online is 28-10-2018.